Why was Blue Sky Educational Foundation (BSEF) founded? Blue Sky Educational Foundation was founded to inspire young people toward careers in science, technology, engineering and math (STEM) by providing them opportunities to experience aviation excitement first-hand. By partnering with like-minded individuals and organizations, Blue Sky offers scholarship opportunities to students who would otherwise be unable to attend aviation-focused camps and receive STEM education. Blue Sky also promotes STEM education in schools through the Aim Higher program. What does BSEF provide that other organizations don’t? 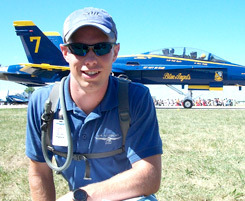 Blue Sky Educational Foundation is unique in that it supports STEM education both in the classroom and “in the field” through aviation organizations and summer camps, such as the EAA Flight Academy. Blue Sky provides exciting aviation experiences that boost students’ exposure to STEM learning and kindle lifelong aviation interest. What programs does BSEF sponsor? In what cities or states are BSEF programs available? 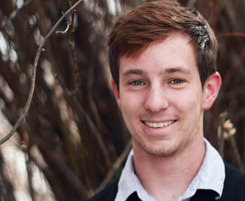 Currently, Blue Sky Educational Foundation awards scholarships in North Texas and Taos, New Mexico. The Aim Higher curriculum has been implemented in middle schools in both Florida and Taos, New Mexico. 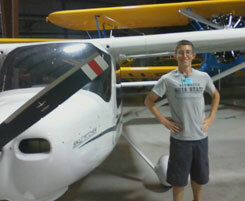 The EAA Flight Academy takes place in Oshkosh, Wisconsin. How many students have you supported with past scholarships and where are they from? 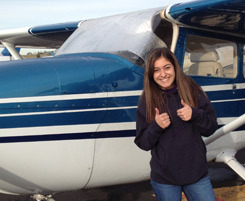 To date, Blue Sky Educational Foundation has sponsored nearly 100 students to attend the EAA Flight Academy. Sponsored students have come from all areas of the United States. How does a student get selected to participate in the summer camps? Students are selected for scholarships based upon their letters of application in addition to letters of recommendation from teachers and administrators. Students interested in applying for scholarships should submit written requests and recommendations to Lee Siudzinski at Lee@BlueSkyFoundation.org. Physical letters can be mailed to 1469 Wicks Road, Three Lakes, Wisconsin 54562. What is the connection between aviation and STEM learning? Science, technology, engineering and math are essential to the advancement of society; however they are often daunting and/or “unpopular” subjects in school. By introducing students to STEM through aviation, Blue Sky Educational Foundation hopes young minds will be captivated by the imagination and excitement of flights and transfer their passion into other STEM focus areas, both in the classroom and in their careers. 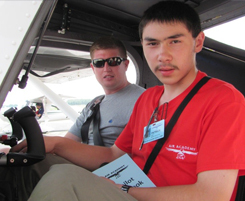 Have any prior scholarship students gone on to pursue aviation or other STEM-related careers? Many students who have been sponsored by the founders of Blue Sky Educational Foundation have gone on to pursue STEM in college and in their careers. For example, students have studied subjects such as physics and aerospace engineering at universities, and many go on to become EAA members themselves. When will BSEF extend the Aim Higher program to other schools? Blue Sky is currently working with additional school districts in New Mexico and Texas specifically. We will continue to post news and updates on our BSEF News Page. Is BSEF seeking donations from other individuals and/or groups? Blue Sky welcomes donations from all individuals and interest groups. All donations go directly to student scholarships. Upon receiving donations, we evaluate student needs and allocate the resources accordingly. If you have any further questions about the donation process or how BSEF handles donations, please contact Lee Siudzinski at Lee@BlueSkyFoundation.org.